There are many good reasons to use a cosmetic airbrush rather than applying makeup the traditional way. For those who are trying to cover up real blotches and blemishes, there is often a huge investment in the amount of makeup required to achieve this. Each time, they go to cover their skin, they find they have to use several layers in order to achieve a near flawless look. The air pods that are involved with airbrush makeup removes this excess. Makeup is applied as a spray on the skin, and it covers in a much lighter, more even layer. Airbrush users typically spend less in refilling makeup kits than those who use traditional cosmetic applications. No matter how many layers are applied, there is always a part of the face that will easily show those layers. Airbrushing looks flawless, like the face is a painting and has not been layered with foundation. Many celebrities choose this form of makeup application because it looks more natural on camera. Each time you use a cosmetics sponge and save it to use for the next makeup application, you are inviting germs to your skin. As the sponge sits, it collects dust and bacteria as it is exposed to the air. 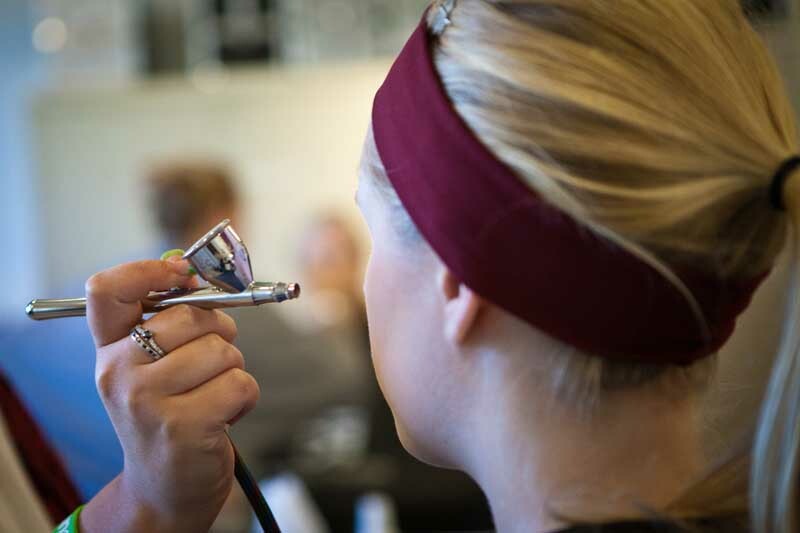 Airbrush makeup goes directly from its tube through the air pod and to the skin. There is no germ-gathering sponge.